This is the start of something, very bad. I finally bumped up the courage to go into a MAC Store (I actually went to the Debenhams counter – but y’ano..). As some people think, MAC Stores can be pretty intimidating to go into – I feel like I’ll get judged or whatever. So, I went to the Debenhams MAC counter and had a browse at the lipsticks – I ended up making a purchase. 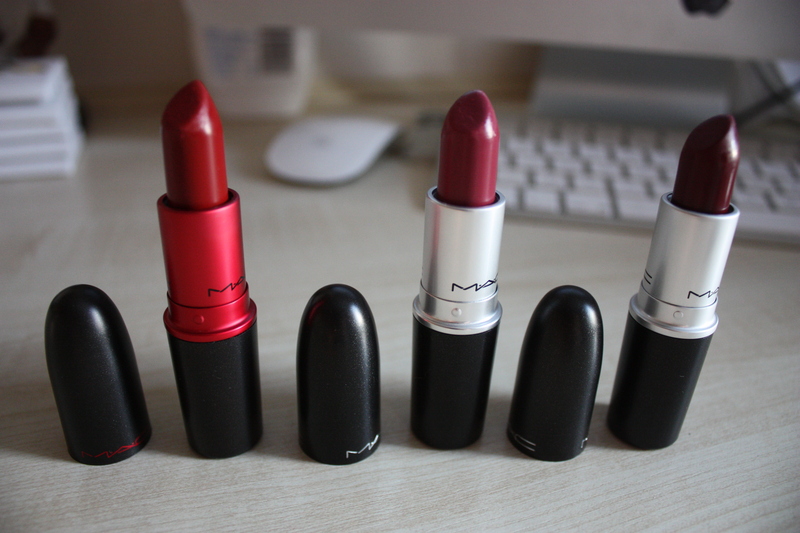 Don’t get me wrong, I find MAC Cosmetics expensive but I feel that I use lipsticks so much, that I would get good use out of these. So that’s the main reason of my purchases! Personally, I wouldn’t pay a large amount for cosmetics that I go through quickly, such as eyeliner, mascara, powder.. Mainly because, IT IS GOING TO RUN OUT, QUICKLY. Moving on, I ended up purchasing the lipstick Diva. I have heard about this lipstick so many times on Youtube videos and beauty blogs – so I thought I would try it out, as it’s a different shade to the ones I have already got and it’ll fit in with the autumnal/winter seasons! I went back to my MAC Store the day after, as our shopping centre had a ‘Student Lock In’ – where they open until 11.30pm and hold really good discounts in certain shops. To my lovely surprise, MAC had a 10% discount – so I couldn’t turn it down. I purchased Plumful. I was treated to the last lipstick and my newest eyeshadow, which I was so grateful about! I didn’t have a red lipstick as I was always quite scared of which shade to use – but I found the most perfect shade for my skin colour! Viva Glam I! Shades from left to right: Viva Glam I (a classic, dark red colour), Plumful (Lustre finish – a sheer plum shade, hence the name, but can be built up into a stronger, outstanding colour) and Diva (a gorgeous dark burgundy colour, which comes out a lot lighter than the tube colour!) I must say that Plumful will need more applications during the day, as it’s a Lustre finish. 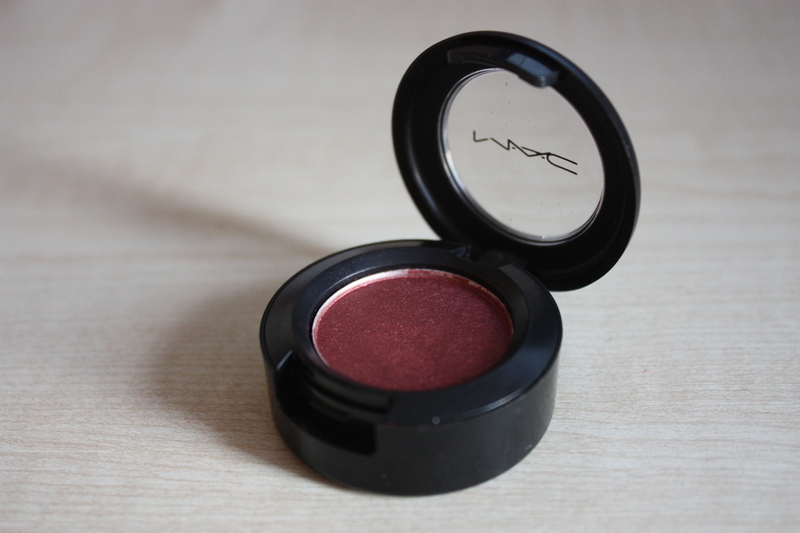 I then took a cheeky visit over to the eyeshadows, where I was searching for the highly raved about ‘Cranberry’ – which is a gorgeous autumn shade, with a slight frost to it. I’m not very adventurous with eyeshadows, which causes me not to wear them that often, but this shade is so gorgeous on and has made me want to wear eyeshadows on an everyday basis! This eyeshadow is also very long lasting, especially with a base underneath. 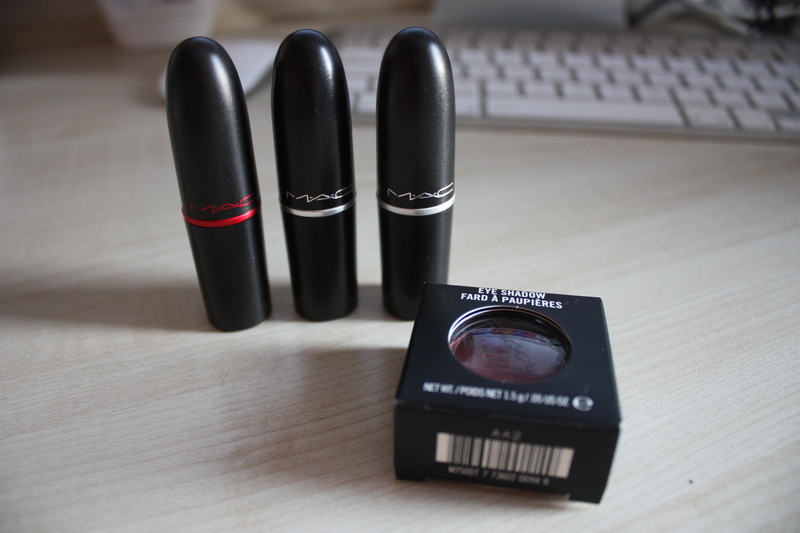 I am very impressed with my first few MAC purchases, I’m too excited to save up to get some more. I will be adding some swatches to this post, when the lighting is better this week – so stay posted! It happened again.. Cheeky MAC visit! Wow, I’m in love w/ this colour. It’s perfect for fall time. You picked out some great colours! Do put up photos of yourself wearing them, I’m sure you’ll look fantastic. Cranberry’s a favourite colour of mine, have fun wearing it! I’m mad jealous of your haul 🙂 I’m loving your lipstick choices, and the gorgeous eyeshadow as well!